After hearing Marvin Bell read last night, I realize my assertion that he could levitate a space ship with his mind was somewhat understated. 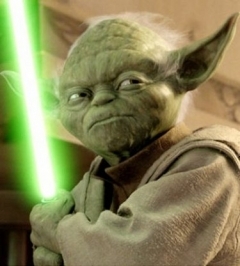 In fact, some might be downright confused by me comparing him to Yoda: is he green? does he have pointy ears? Not to my knowledge. He does invert syntax to bring pressure and rhythm to language--but, unlike Yoda, in doing so, Marvin remains grammatically correct. There really are two aspects of Yoda that remind me of Bell. First, Yoda is a master teacher of an unteachable magic called the force. Second, and most importantly, in Episode II (the fifth film ever made) George Lucas gave every Star Wars junkie what they had long craved: the opportunity to see Yoda wield a light saber himself. With blinding alacrity and consummate skill, Yoda shows himself not only as a master teacher, but master practitioner. After Marvin's poetry reading last night, a fellow student leaned over to me in the darkened theater and whispered, "he's a genius." Having spent last semester studying with him, I wanted to whisper back, "well, duh." Categories: MFA and Poetry. Tags: MFA Residency 4, What stuff means to me, and Yoda. Poets: Marvin Bell.